Have you heard of Blazblue? Have you heard of BlazBlue: Continuum Shift, BlazBlue: Calamity Trigger, BlazBlue: Chrono Phantasma or BlazBlue: Central Fiction? More importantly, have you played any of those? For they are videogames, arcade fighting experiences released across several formats. If you are aware of these, then you’re probably all primed for Funimation’s release of Blazblue (pronounced Blaze Blue) Alter Memory, the anime spin-off from the video game series. The last fighting game I played was Tekken, the first one. 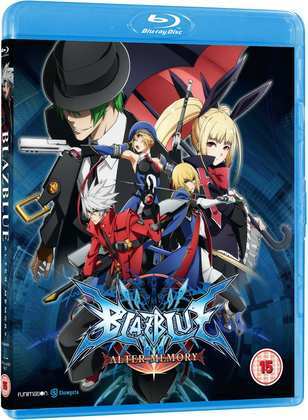 All that I know about Blazblue is that it was one of Funimation’s earliest anime announcements when they entered the UK market, and it has been delayed repeatedly. It is finally coming out now though, and I approach it with all the vigour and enthusiasm with which I approach all anime adapted from videogames. Translation: You may want to take this review with a pinch of salt. Anyway, after watching eight episodes, I haven’t the slightest idea what this show is about, so I’m copy-pasting the case blurb from an e-tail website. The twelve episodes of Blazblue: Alter Memory are presented across two Blu-rays as follows. This is a Blu-ray only release in the UK. The discs get the standard 1.78:1 widescreen 1080p transfer. The image is clear and sharp throughout, with strong, consistent colours. The only issue might be with digital banding, mostly on scene fades, but stronger here than I have seen of late on anime Blu-rays. The anime is well accomplished, with strong, fluid action animation, plenty of arcane special effects, and appealing character animation. The characters are a little on the generic side, with the protagonist Ragna somewhat reminiscent of a cutesy Dante from Devil May Cry, while the antagonist, Hazama/Terumi looks just like Gin Ichimaru from Bleach, but with green hair. It’s a perfectly watchable show though. You have the choice between Dolby TrueHD 2.0 Stereo English and Japanese, with subtitles and signs locked during playback. Other than extremely low volume, the audio presentation is adequate, with the action coming across well, and with some enthusiastic and character appropriate voice actor performances in the Japanese that I listened to. I gave the English dub a quick try and it seemed equally adequate. The subtitles are timed accurately and are free of typos. The discs boot to animated menus. Disc 1 autoplays with a trailer for Hyperdimension Neptunia. Disc 2 kicks off with a trailer for Tokyo Ravens Part 2. On the disc you’ll find the textless credits, the US Trailer, and further Funimation trailers for Ping Pong the Animation, Fairy Tail Collection 4, Soul Eater Not!, Noragami, Michiko & Hatchin, D-Frag!, and Nobunagun. My heart just isn’t in writing an extended review for Blazblue. I recently gave one of my most loathed series, Horizon on the Middle of Nowhere a second chance, another watch through to see if its incomprehensible plot obscured by oodles of fan service would this time resolve into a watchable show. It didn’t, and the discs went off to metaphorical landfill, never to be watched again. Blazblue is even worse when it comes to incomprehensible plots. I have absolutely no idea what this show is about. I couldn’t comprehend the story, and I certainly had no means with which to engage with the characters. It was a divorced and sterile experience for me, made worse by the tedium that results when something that you don’t understand unfolds in front of you. I had to watch two episodes over again when I fell asleep during their runtime. Subsequently, if I fell asleep, I just didn’t bother. Given that this happened during the final episode, you wouldn’t be unjustified in accusing me of slacking on the job. But I have no intention of watching Blazblue: Alter Memory ever again. No second chances. Blazblue is a show replete with jargon. It’s the equivalent of technobabble on Star Trek, a whole lexicon of bizarre phrases and words that mean something in this universe, and mean something to those in the know, the members of the club. Unfortunately, I’m not a member of that club, which turned half the dialogue into “Blah the Blah, because the Blah Blah Blah has Blah Blah’ed the Blah.” Fortunately, I suspect that the membership dues are paid by playing the games. If you’ve worked your way through the Blazblue videogames, then it is more than likely you will understand what this story is about, who the characters are, and why they interact in the way that they do. Maybe then you’ll understand who Ragna is, why he does what he does, just how he’s related to Jin, to Saya, to Hazama, why he keeps encountering girls with the same face. I could continue in this vein of complete oblivion. But I think I’ve made it clear how I feel about Blazblue: Alter Memory. I couldn’t make heads or tails of the story or the characters, and I suspect that the same will be true for anyone else who approaches this show without the crutch of the videogames to lean on. Never more apt has been the phrase, ‘for fans of the games only’. On the bright side, the show is animated with vigour, the story has a rapid and appealing pace to it, and the voice actors bury themselves in their respective parts. I don’t think those game fans will be bored with Blazblue. Alas, the only use I see in these discs is as a cure for insomnia.